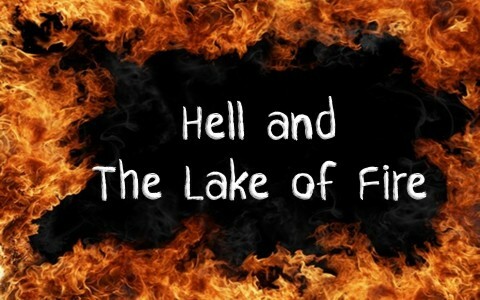 What is the difference between hell and the lake of fire? Are they the same or are they different? Jesus spoke twice as much about hell as He ever did heaven, but why? It was because He didn’t want anyone to go there. If you knew that there was a bridge out around the corner, but no one else did, you’d be frantically trying to stop traffic so that people wouldn’t be killed, wouldn’t you? Naturally you would, so that’s why Jesus spoke so often about hell. He wouldn’t take up so much of His ministry warning people about hell if they were simply burned up as some believe. People who believe this are called annihilationists, but is this true? Are unrepentant people simply annihilated after the judgment? There is no way to support this belief from the Bible. The Bible plainly states when the unsaved die, they await a final judgment of their sins in a place called Hades (the Greek word for the Hebrew word sheol), however this isn’t the final destination of the unsaved. They are ultimately judged at the Great White Throne Judgment mentioned in Revelation 20:11-15. The Prophet Daniel wrote of these last days by writing that “many of those who sleep in the dust of the earth shall awake, some to everlasting life, and some to shame and everlasting contempt” (Dan 12:2). Daniel must have wondered about when this was to be, but God simply told Daniel to “shut up the words and seal the book, until the time of the end. Many shall run to and fro, and knowledge shall increase” (Dan 12:4). Is this “the time of the end” when the sealed book is now open? Certainly in this world, many are running to and fro, and knowledge has increased exponentially, but sadly, it’s not the knowledge of God that is increased, but the knowledge of facts, which doesn’t help any in knowing Christ. In speaking of sheol, it appears to be temporary; however the lake of fire is not. In the Great White Throne Judgment, the Apostle John writes down what Jesus told him to (Rev 1:1-2), and so he wrote that he “saw a great white throne and him who was seated on it. From his presence earth and sky fled away, and no place was found for them” (Rev 20:11). While there, John “saw the dead, great and small, standing before the throne, and books were opened. Then another book was opened, which is the book of life. And the dead were judged by what was written in the books, according to what they had done” (Rev 20:12). This is fatal because no one can be saved by works (Eph 2:8-9), and since many think they’re a good person, they believe their works will earn them access to heaven, however God will not accept human works. It must be the righteousness of Christ or nothing (2nd Cor 5:21). For those who believe their works can save them, they will face “the second death, the lake of fire. And if anyone’s name was not found written in the book of life, he was thrown into the lake of fire” (Rev 20:14b-15). There are several places in the Book of Revelation where John witnesses a lake of fire, and this lake of fire, whether literal flames or not, is given in Revelation chapters 19 and 20. In Revelation 19:20, John wrote that “the beast was captured, and with it the false prophet who in its presence had done the signs by which he deceived those who had received the mark of the beast and those who worshiped its image. These two were thrown alive into the lake of fire that burns with sulfur.” This is the final destination for Satan and his demons. Scripture says “the devil who had deceived them was thrown into the lake of fire and sulfur where the beast and the false prophet were, and they will be tormented day and night forever and ever” (Rev 20:14). The Greek word for the “lake of fire” is “limnē,” for lake, and is the same word used elsewhere for lakes of water. But this lake is different because it’s a lake of fire. The Greek word used for fire is “pyr” which is the same word used for fires, as in the fire that the Apostle Paul threw the snake into after it had bitten him (Acts 28:5), so it’s not an analogy of a fire or symbolic of fire, but it must be the real fire, as in fire that burns. The warnings about hell fire are given throughout Scripture, specifically in the New Testament where John writes about all who have refused to trust in Christ, warning, “if anyone’s name was not found written in the book of life, he was thrown into the lake of fire” (Rev 20:15). Where is hell? We don’t know the specific location of where hell is except that it’s sometimes referred to as being “down,” but we do know that it’s a place of weeping and gnashing of teeth (signifying eternal regret), of outer darkness, and is permanent. This is why evangelism is so important. You wouldn’t wish that on your worst enemy. It’s so terrible that it’s beyond description and it’s beyond comprehension, and only those that are there can know what such torment feels like. When hell is mentioned, it is often associated with fire, so hell and the lake of fire seem to be referring to the same place. Jesus warned His listeners about the reality of hell and the permanent state of being there as He said it is “where their worm does not die and the fire is not quenched.’ For everyone will be salted with fire” (Mark 9:48-49). Most people might miss the fact that it’s their own worm that does not die…meaning that it’s specific to them. What is this worm? Is it the conscience being tormented because they knew in their hearts that God truly does exist but they simply suppressed this knowledge, and so they have no excuse at all (Rom 1:18-20)? The Bible says that hell and the lake of fire are real. There is no second chance after death, as some cults falsely teach, and which cannot be found in the Bible. The Bible says today is the day of salvation (2nd Cor 6:2). Jesus warned about hell so many times because He knows that it’s real, and of course, He doesn’t desire that anyone perish, as the Apostle Peter writes that God is “not wishing that any should perish, but that all should reach repentance” (2nd Pet 3:9), so let me ask what the Apostle Paul asked his audience: “do you presume on the riches of his kindness and forbearance and patience, not knowing that God’s kindness is meant to lead you to repentance” (Rom 2:4)? Related reading: Is Annihilationism Biblical? I want to get free daily updates and books as mentioned above. I just got you signed up sir. Thank you so much for subscribing to our newsletter/devotionals. Thanks for your scriptural observation about the the relationship between Hell and lake of fire.May I remind you that Job pleaded to go there (job14:13&14),Jesus our Lord also went there (acts2:31).Hell for what it is refers to literal grave of every human. Lake of fire symbolizes total destruction as reflected at Revelations 20:14&15 hence those referred to by the Bible as going there where symbolic viz;false prophets, the wild beast and hell itself (rev19:20;20:14).Therefore the teaching of hell having fire to destroy eternally is not biblically founded as the teaching were sourced by ancient Roman philosophers. There are too numerous scriptures to corroborate the nullity of hellfire. Thanks. May God bless you so much Jack Wellman. I’ve been following your teachings and i can testify with the spirit of Almighty Father in heaven that you teachings are true. May our Lord continue giving you His knowledge and wisdom. Next post: Who Was Goliath In The Bible?